Interested in learning about Canadian Retailer advertising opportunities? Unified commerce is transforming retail through the use of data, creating consistently seamless experiences across channels. 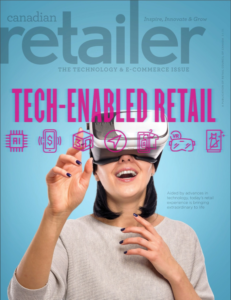 Retailers are finding their digital fit through a full-spectrum of tailored digital solutions. Do you understand the Canadian consumer? Consumers’ attitudes change frequently. Find out what influences their decisions and the experiences they seek. Integrated data is helping retailers develop enhanced strategic merchandising plans. Digital video is attracting attention from retailers looking to burnish their brands and enhance sales through shoppable video. Voice search is supplementing local, mobile and the internet when it comes to online shopping, impacting the customer experience. Social media provides retailers with an additional platform to engage customers…and an additional channel of commerce. Do you know how attitudes of different consumer demographics vary? Learn what they think of retailers’ product offering, online and in-store experience, customer service, and more. Behavioural economics can help retailers better understand their customers, propelling them to greater success. Retailers are always trying to get closer to customers. One of the ways to do so is knowing just how close they are. Equip your information system to meet the challenges of unified commerce. With the integration of their information system, eCommerce platform, client database and stock management system, retailers can optimize their omnichannel commerce processes. Canada’s shopping centres continue productivity as landlords invest heavily to create compelling gathering places, and adding ‘experiences’ to create multi-use community centres. Access the archive of previous issues of Canadian Retailer.